The third and final version of the three-handkerchief weepie about a long-running and painful love affair between a married man and his backstreet mistress updates the story and gives it the full Ross Hunter treatment. 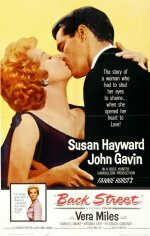 This time the suffering pair are cast for glamour, with Susan Hayward languishing in luxury and sumptuous clothes by Jean Louis, and the glossily good-looking John Gavin playing the object of her tormented affections. David Miller directs efficiently, while Vera Miles supplies an entertaining turn as Gavin's alcoholic wife. It may lack the class and poignancy of the 1941 version, but this is still a shameless and wildly enjoyable melodrama.